We are a small yet dynamic team of music therapists, all trained in Music Therapy practice to a Master's level and registered with the Health and Care Professions Council. We currently provide music therapy to a range of establishments for children and adults around London, particularly the London boroughs of Enfield, Barnet, Haringey, Tower Hamlets and Lambeth. We specialise in the provision of music therapy to children in mainstream education who are in need of additional support. We work in schools, children's centres, pupil referral units (PRUs) and day centres. We also provide musical awareness workshops for teachers, teaching assistants, managers and care workers. Music therapy is becoming standard practice within the mainstream education sector due to the increasing numbers of children with Special Educational Needs and complex family situations in mainstream primary schools. At the music therapy tree we know that many of these children can thrive in a mainstream education environment but need that little extra support to help them through their education. We believe that all children can reach their potential through music. The UK music therapy profession is regulated by the﻿ Health and Care Professions Council﻿ and represented by the British Association for Music Therapy. All our music therapists have a Master of Music Therapy degree, are registered with the HCPC, are members of the BAMT and are CRB checked. Music therapists undergo regular supervision and keep clinical notes to monitor their practice. Some of our music therapists also run a school choir, where their in-depth knowledge of the pupils allows everyone to be involved in music, regardless of their ability. Our journey began with St James’ Primary School in Enfield which has provided music therapy to pupils with autism, ADHD, learning and physical disabilities and emotional needs since 2010. It was the pioneering vision of current Head teacher Jo Dimmock and previous Headteacher Allan McLean of St James’ that led to music therapist Camilla Farrant providing music therapy to children who were in need of additional social and emotional support. 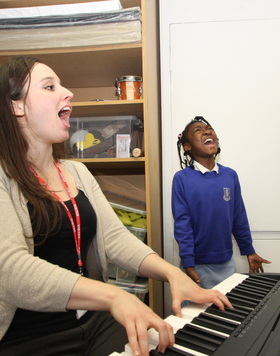 Motivated by the impact of music therapy on children's wellbeing, the conviction of St James' staff and the encouragement of Enfield Music Service, the music therapy tree now provide music therapy to children in schools across several London boroughs. St James’ Primary School exemplifies the gold standard of how music therapy can fit within a mainstream education environment. Children regularly attend 20-30 minute sessions during class time, while the choir offers all children in the school an outlet for musical expression and enjoyment. "Music therapy is a wonderful way to support pupils. It is something rather special; an outlet, an escape or indeed it becomes a personal journey. Having had the delight of seeing a number of pupils with a variety of needs succeed because of music therapy I cannot recommend it more strongly. As a school leader, I believe that all children should have the opportunity to reach their potential, and a therapeutic intervention such as music therapy enables that to happen."